Hanse 345 is the fuzziest line which is steeper at first, has a camel hump on the top and is the last to reach zero at about 127-128 degrees. I know the curves are only an estimate so I'm not sure as to how exact (the probability distribution around the curves) they are. I don't know anything about the initial parameters that are used either, or how much they affect the curve. Or even if they both use the same initial weight additions or the same placements of those in the boat (considering center of gravity and angular momentum). 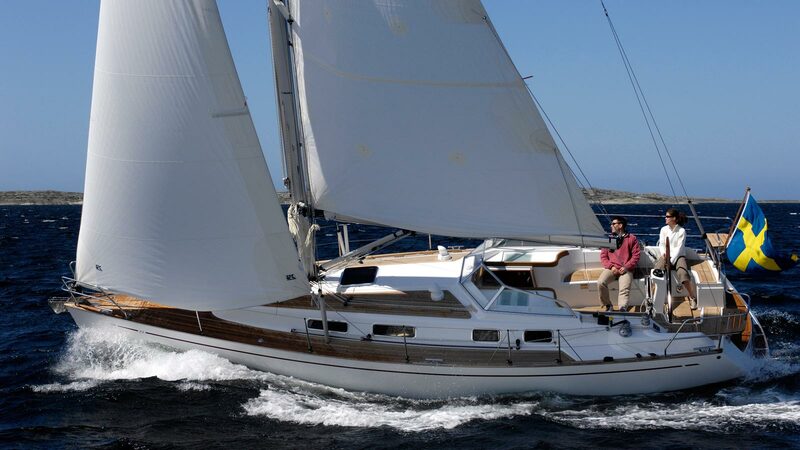 Hanse 345 was calculated from a weight of 6640 kg. But still 420 additional kg sounds less than crew, luggage, equipment and some water and diesel. The plots were a little bit inaccurate as well. But if we are a bit bold we can play a little bit around with the plots. The total stiffness (area beneath the curves) of these two boats are about equal. Hanse is slightly stiffer up to almost 40 degrees. Better hull stability? Then the HR 342 is stiffer until some 95 degrees, which should more or less be a full knockdown. A lower center of gravity on the HR? Then beyond 95 degrees the Hanse is stiffer all the way until it reaches a slightly higher angle of vanishing stabiliyt (AVS). The buoyancy of the higher freeboard on the Hanse? Beyond the AVS I doubt that the plots are particularly accurate due to difficulty of estimation. But if they actually are, it is easier to get rolled back up if you are in (or beneath) a Hanse. If all the interior still is in place of course . Even though I doubt you can compare these two plots as directly as this, you can probably say that HR 342 and Hanse 345 are more or less equally stiff. Quite impressive I would say! Especially considering the reputation of HR. And for people that live in volatile areas and has experienced a few knockdowns this definitely weighs in heavy. I seriously doubt that any of the other sailboat brands that compete in the same bracket as Hanse are anywhere close to this. Some zooming and alignment of the HR 342 plot shows that a GZ of 0.7m approximately corresponds to a GM of 4000kg*m ==> 5714kg used in the calculation. This means that HR 342 had about 414 kg of added weight, while Hanse had 440kg in the stability curve calculations. Assuming they both placed the added weight more or less in the same place, all the comparisons I did above are actually accurate and relevant. 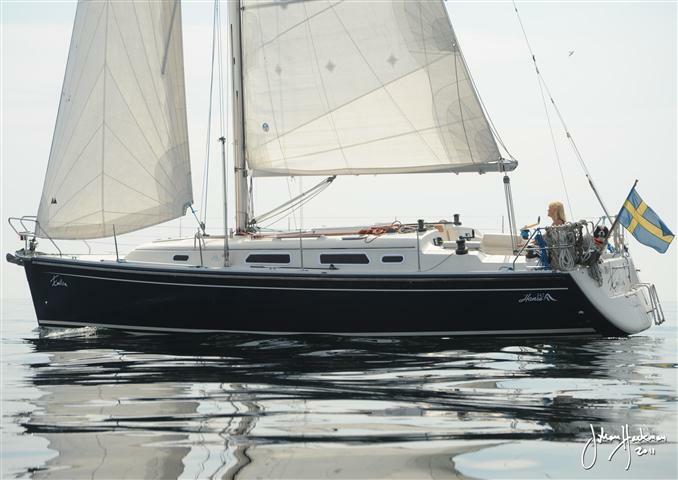 1: Hanse 345 is slightly stiffer from 0 to about 38 degrees. This is the normal heeling range. 2: HR 342 is stiffer from about 38 to 95 degrees. This is a common range for broaches and knockdowns. 3: If we say that 0 to 95 degrees is what most of us will ever experience, HR 342 is stiffer overall, but not by much. 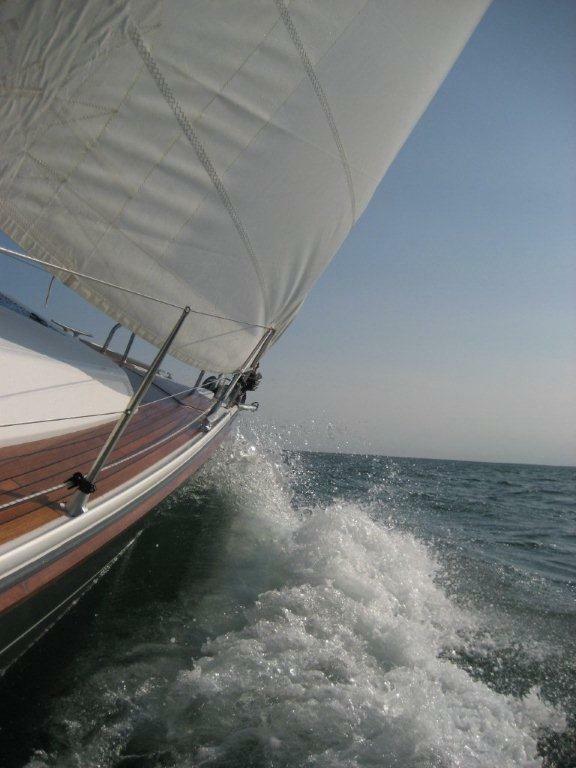 4: Not many of us will ever experience this, but beyond 95 degrees Hanse 345 is more eager and prone to right itself. HR 342 is stiffer from about 38 to 95 degrees. This is a common range for broaches and knockdowns. Anything less than 95 degrees in a broach is for sissies. Here's a video made by the german YACHT magazin. It shows the new Bavaria 33 vs. Hanse 345. There are two things I don't like: The wooden planks above the main windows and the double wheels. I like the Bavaria. It seems to be a nice boat. solutions and a much nicer look, this combined with a lower price than the 345.
and am still happy with my 375. Yes the Bavaria 33 looks nice. Pretty interior, nice cockpit, FOUR winches. I'm curious if it is available with a traveler for the main sheets? The biggest minus with the Bavaria 33 is the keel weight: 1300 kg... With that wide hull you just know it is going to bob around like a cork when the weather gets ugly and the waves start to build up. And from the video it seems like it is starting to bob and wobble even though it doesn't seem that windy. I'm really curious about how it will behave in some big swells, considering the very wide transom. If I'm not wrong the wooden board above the windows on Hanse is for handholds as well as for covering the lines. It is much nicer to grab some wood than an icy cold steel bar like on the Bavaria. So maybe the aesthetics is a bit weird, but I personally prefer that solution. Ok, a steel cradle isn't the end of the world, but in my opinion it is the one thing that is going to really stand out as unsightly. Out of fairness to our B...... sailing friends (whom we mostly feel sorry for ) I would have to confess that the B...... 33 is an improvement. BUT, I think the Hanse 345 is clearly in the lead in my view. Allthough the double wheels on the 345 might seem to be an overkill, I am personally convinced that it is a very practical solution and more convenient than a very large single wheel. I just said that the Bavaria looked nice. I did not say which was my favourite...but it is.... the 342! It is a shame they don't make them anymore.